'You probably think you know the story," says the sardonic voiceover at the start of Hoodwinked, as we see a leather-bound volume of classic fairy tales lying open at the legend of Little Red Riding Hood. The movie then dresses up this old granny of a fable in the vulpine comedy of post-Shrek, multilayered family entertainment, tailored to an audience fully aware that the word "hood" denotes not only a type of head-covering but also urban territory disputed by gangs. The French fabulist Charles Perrault was the first to commit the story to ink, publishing it in 1697 as Le Petit Chaperon Rouge. Most of the details that have become familiar enough to be satirised three centuries later are in this initial telling: a young girl's visit to a sick grandmother ending in death as a result of flirting with a wolf (in fact, a werewolf) in the woods. The colour of the head-covering could be taken to symbolise either sin or the blood of female fertility. Adolescent girls of the time didn't have to wait for Freud to discern the message in the story of the dangerous, hairy protruberance that may lie behind unthreatening clothes. "Seeing the wolf" even reportedly entered French slang as a euphemism for losing one's virginity. 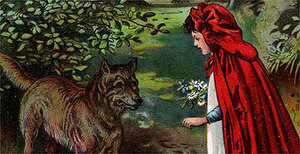 Perrault directed his allegory at girls wandering off the track and chatting to chaps, although in earlier European oral versions the heroine is more reminiscent of the Red character in Hoodwinked, who outwits the wolf to survive.